Such a fun recipe today! You guys remember sometime last week I mentioned that my family is headed on a big vacation at the end of the month? Well, I kind of left you all hanging as to where we are actually going. Don’t be mad, but I wanted to wait to tell you guys the location because of well, this sangria! So can you guess? Where is the Gerard family headed?!!? If you guessed Mexico than you are right on! I feel like it’s kind of obvious though, I mean with the whole tequila in your sangria thing… only when in Mexico, right? The thing about this trip is that it kind of just happened. All the sudden my mom figured out a way to get all seven of her kids, my dad, Caitlyn (Kai’s girlfriend), Lyndsie (Brendan’s girlfriend), my cousin Maggie and her boyfriend Tom, all in one place at the same time. If you have a big family, than you know that getting everyone together at the same time is HARD. We have not done a big family vacation like this since we were kids. I think that last time we were all together, aside from Christmas (that is a must!) was three years ago at my grandparents 50th anniversary when we all went to Isle of Palms in South Carolina. So to say that everyone is excited would be an understatement, and as you read, we have some extras on board, but the girlfriends are pretty much family, and Maggie (aka Marge) is actually blood related. Tom, well, he is Tom! It’s going to be one packed house down in Mexico, but I have no doubt in my mind that it will be so much fun. PLUS!! Um, hello, we get to eat all the Mexican food! Bring on the TACOS, churros, homemade flour tortillas, Palomas and whatever else I am forgetting! So pumped. I will actually be joining the family a little late (I hope, I hope… I hope I can make it! ), but better late than never I guess. OKok, but enough about vacations and Mexico… oh but the palm trees and the waters!! Ahhh! So this Rosé Tequila Sangria! Clearly it is Mexican inspired. Although I’m pretty sure Rose’ is not a Mexican wine, I feel like the tequila holds down the Mexican place-card. 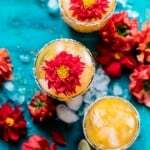 I’ve been wanting to make a summer inspired sangria using Rose’ for a few weeks now, and when the trip to Mexico came up, Tequila Sangria came to mind. 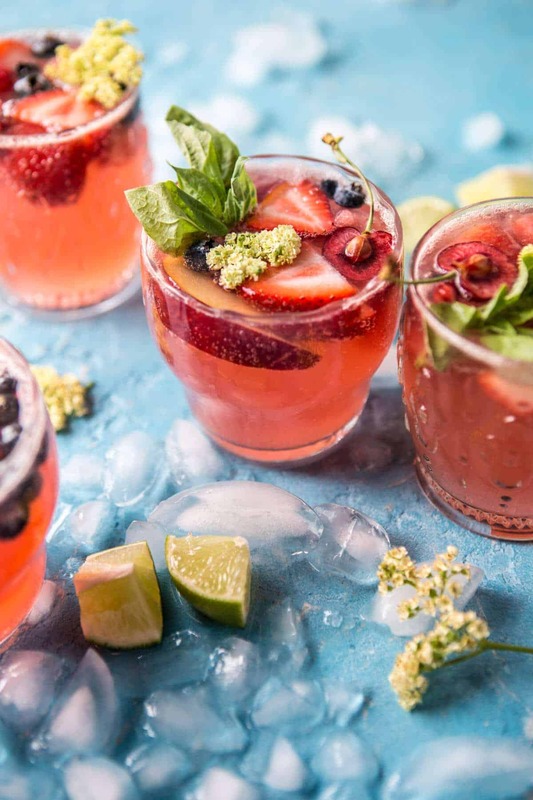 Honestly, these sangrias are kind of like a big batch of fruity margaritas… which in my mind is kind of epic. They’re also so easy to prepare, perfect for summer entertaining. Just add everything to a BIG pitcher, give it a stir, chill it, and then drink up. Something I love to do whenever I make sangrias is to top each individual drink with a little sparkling water. Lately I’ve even been using Kombucha in place of sparkling water, but that can get pretty pricy if you are serving a crowd. 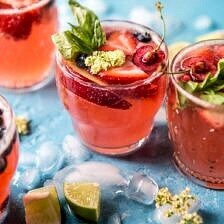 Either way, I love the added fizz, especially for light and fun summery drinks like these sangrias! Finally, if the combo of tequila and Rose’ have not yet sold you, just look at how pretty these are?? I’m thinking 4th of July party drink FOR SURE. 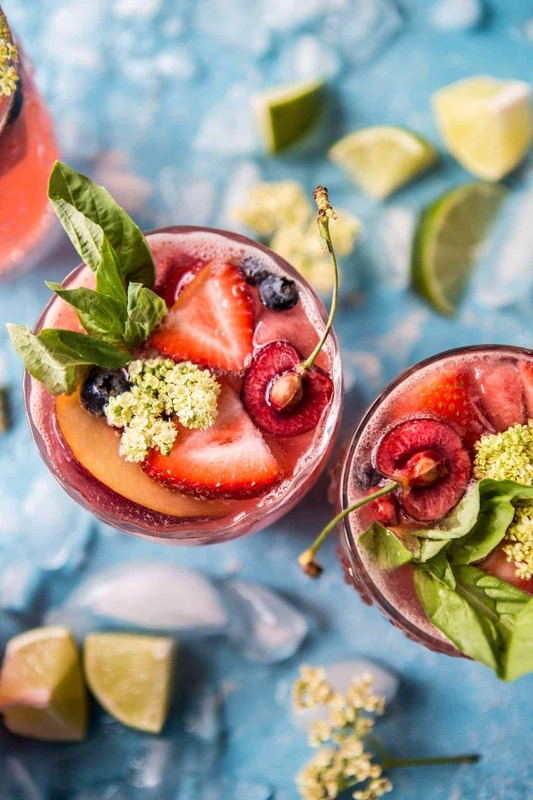 Honestly, these sangrias are kind of like a big batch of fruity margaritas... which in my mind is kind of epic. In a large pitcher, combine all the ingredients except the sparkling water (or kombucha) and basil. Stir, gently to combine and then place in the fridge until chilled. 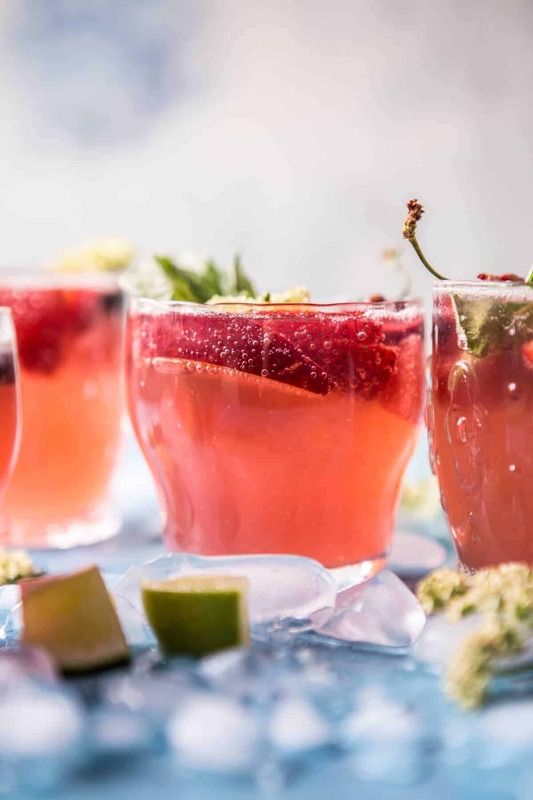 To serve, give the sangria a good stir, then fill each glass with ice and pour the sangria over the ice. Top with sparkling water or kombucha. Garnish with basil and edible flowers. Drink up! 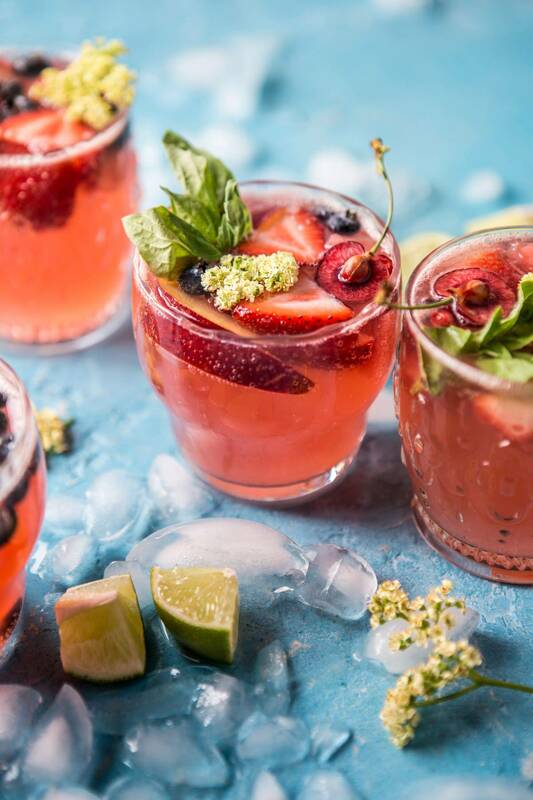 Gotta love Friday…especially in the summer… and surely when sangria is involved. Yes, Please! 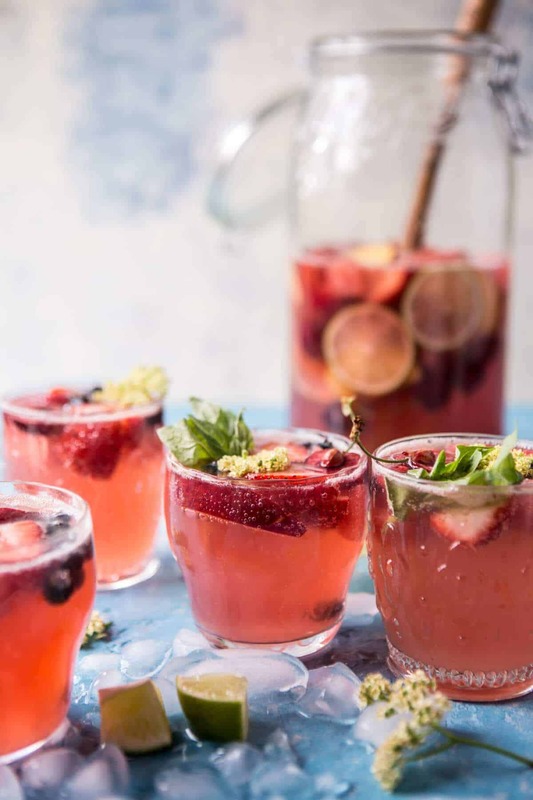 Oh yummmm I love sangria, and I love rosé, though it tends to not sit well with me. 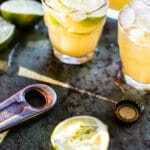 One recipe to try, that is for sure!!! 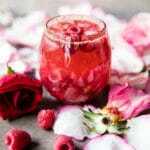 This drink looks so yummy! You need to give yourself a break and go to Mexico girl!! That’s so exciting for you and your family to be getting together on this trip. I’m not gonna lie, I’m pretty excited that I get sangrias out of this whole deal too! 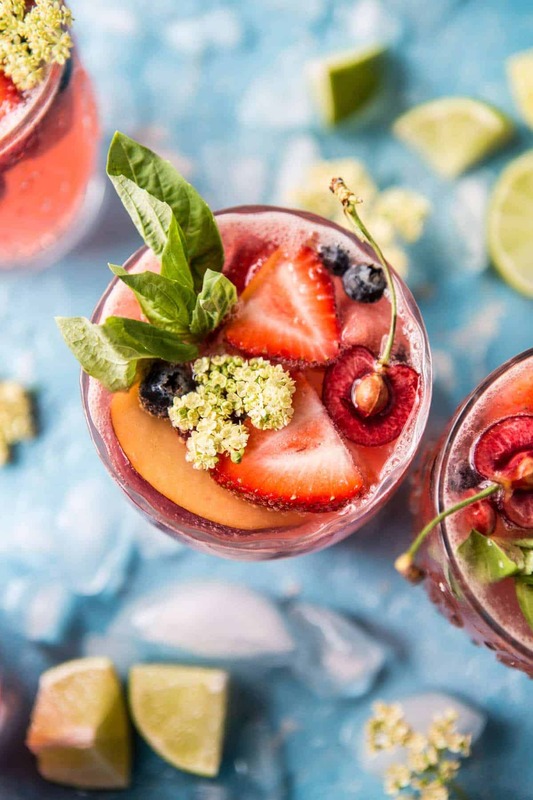 These drinks are so drop-dead-gorgeous and they sound super refreshing, YES! The pictures are up! Sorry about that! I am really sorry, we had some tech issues, but the photos are all up now. Again, so sorry! I used my imagination to see how beautiful they are, delicious too! The pictures are up!! but they are so delicious, definitely give these a try! Such a great refreshing idea for the summer time. Can’t read enough about your mexico vacation. I have never been there. I travelled often to africa in the bush to see the animals in real life. It’s amazing. I will Keep this recipe in mind for my summer parties. I haven’t published such a drink on my blog yet so it’s a great benefit for me to share it. Thank you Janine! I’m super excited for Mexico! Should have a lot to write about! 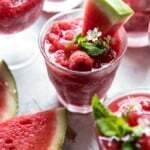 They would be perfect for a summer party!! Hope you love them! Oh my god. Love this, Tieghan! The photos wouldn’t load for me, but this sounds so perfect for summer. Rosé is a favorite and loaded with a ton of fruits, especially strawberries and peaches, I’m so in love. Thanks for this sangria recipe. I know how to impress my summer guests now! The photos should be up now! Sorry about that! I hope everyone loves it Andrea! Oh Tieghan… you know how to woo me. What a glorious cocktail! Have such a wonderful time in Mexico! We were there in February and we ate and drank very well (it helps that the exchange rate is in our favor). I love sangria but I can’t drink it because I can’t breath afterwards. But every once in awhile I have a small glass. This would be worth tasting! AH such a bummer! It’s so tasty, you’ll have to give this a try but only a little!! Were going to Cancun!! I’m so excited!! Thank you! My sister and I just made this and it is soooo good!! The only problem is…uh…I’m not sure we needed 8-10 people to finish it all..hehe. Thanks for this one! Oohh my! This is right up my street!!! Just looking at theese makes me happy!!! Mexico sounds awesome, hope you will make it and have great time! This is so gorgeous, Tieghan! Prettiest sangria ever :). Can you recommend a good rose to use? Hey Whitney! I loved this list of rose from Food and Wine. I have only tried a cheaper variety, that I was not too found of, so I can’t recommend one…yet! I will report back soon, but in the meantime, use this list it was really helpful! Sounds delish! Happy you liked it! How far in advance can this be made so the fruit isn’t too mushy? How big is one serving? How many ounces?? Thank you!